Harvard researchers say they have developed a robotic bee that can fly, dive into water, swim, and then burst out of the water again and land. “This is the first microrobot capable of repeatedly moving in and through complex environments,” Yufeng Chen, the first author of the paper, said in a statement from Harvard. 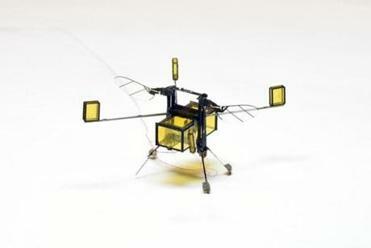 It’s the latest in a series of robotic bees, or RoboBees, that have been developed at Harvard. Robots that can fly and dive could someday be used for applications including search and rescue operations, environmental monitoring, and biological studies, the statement said. The research, which was published in the journal Science Robotics, was undertaken by a team from the John A. Paulson School of Engineering and Applied Sciences and the Wyss Institute for Biologically Inspired Engineering. Chen was a graduate student at the engineering school when the research was conducted. The robot is about 1/15 the weight of a penny. It is about 2 centimeters tall, with a wingspan of 3 centimeters, slightly more than a quarter, Chen said in an e-mail. The robot has been designed to have two different wing-flapping speeds, one for the air and one in the water. Surface tension at that small scale “feels like an impenetrable wall,” preventing the robot from getting back out of the water, Robert Wood, senior author of the paper, said in the statement. The solution, the researchers found, was to outfit the robot with a gas collection chamber and buoyant outriggers. When the robot swims to the surface, an electrolytic plate in the chamber converts water into combustible oxyhydrogen, which pushes the wings out of the water. The outriggers stabilize the robot. Then the gas is ignited, propelling the robot out of the water. “We had to come up with a creative solution to exploit resources from the environment,” said Elizabeth Farrell Helbling, a graduate student who coauthored the paper. The robot is designed to land on its feet. It can then take off again. So far, it cannot immediately take flight after popping out of the water. The robot does not carry its own power source, brain, or sensors, but researchers in the lab are working on putting those aboard in the future, Chen said.